We are home from our whirlwind 7 day tour of Washington DC. We saw A LOT while we were there. Walked A LOT every day. 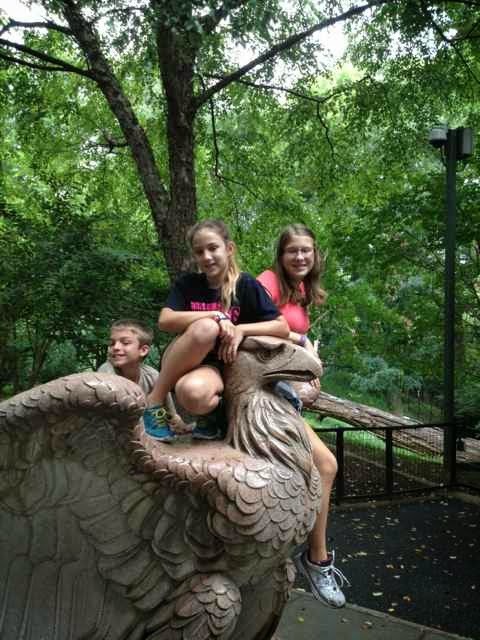 Had so much fun. 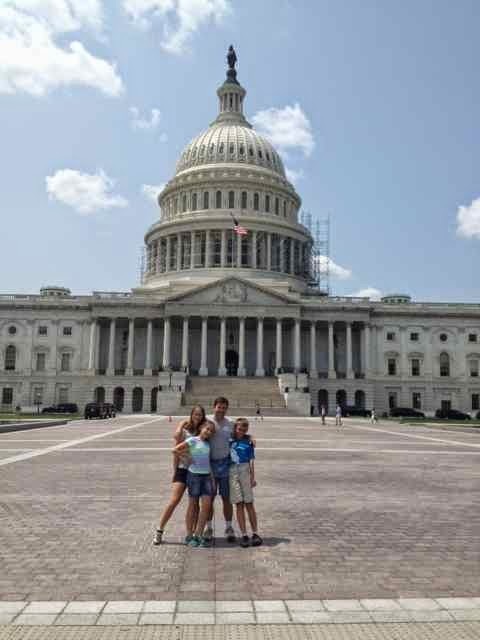 Here is the family in front of the capitol. We did the tour and got gallery passes to sit in the house of representatives and watch. The kids were not impressed with the efficiency of our elected officials as they gave speeches to a scattered collection of staffers all texting madly on their phones. 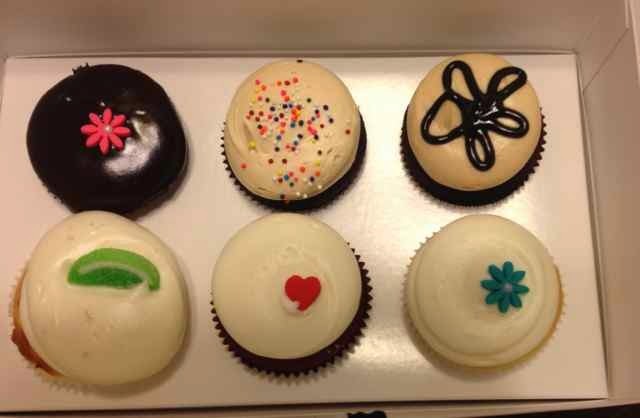 Sydney requested a trip to Georgetown cupcakes. We combined that with a dinner, but saved the cupcakes for after. My favorite day was a trip out of the city to Front Royal. 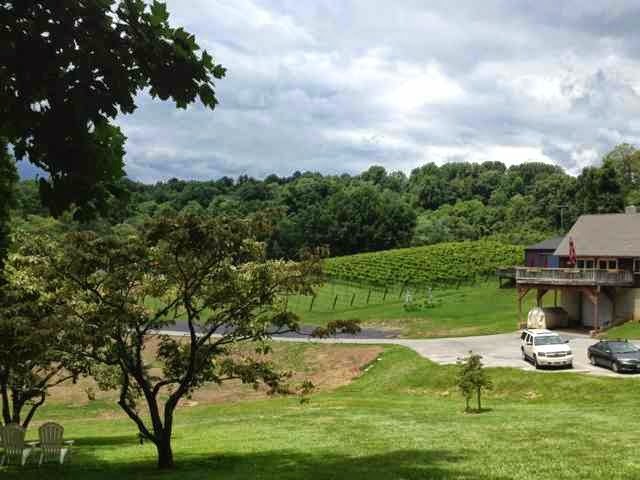 The adults did a little wine tasting at Naked Mountain Winery. The kids picked blueberries and peaches and rolled down hills. We don't have hills much around home, so they had a blast. Everyone loved the Zoo. We even glimpsed Bao Bao the baby Panda. 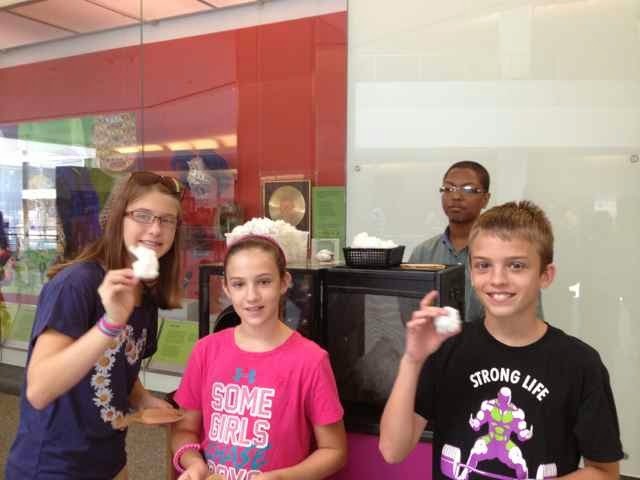 The kids got to gin cotton at the American History museum. Combined with the outside monuments and Natural History it was a long day of walking. We went up to the top of the Washington Monument and watched money being printed at the bureau of engraving. What else? Air and Space was Ryan's favorite. He like the new one better than the old. The weather at Mt. Vernon was unbelievably beautiful. Honestly, all the weather was fantastic. Sydney was disturbed by the naked people in the paintings at the National Museum of Art. Kurt made fun of modern art in the sculpture garden. We are all glad to be home again though. It will be lovely to sleep in my own bed tonight. 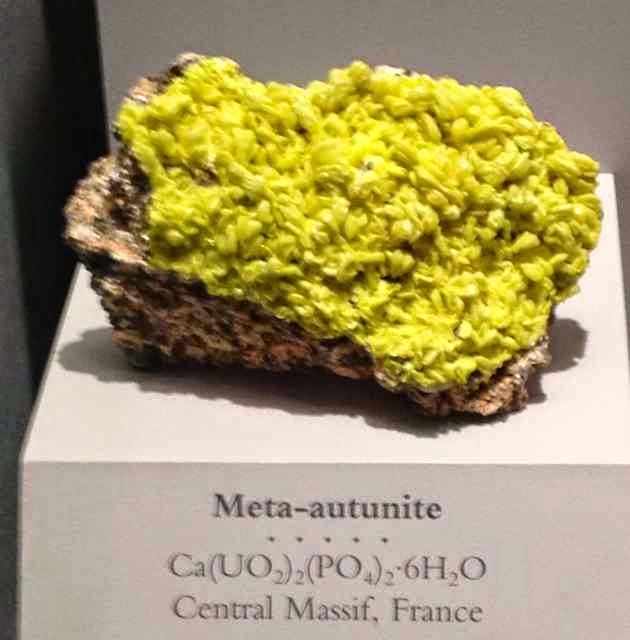 Check out the rock from the Natural History museum. Isn't it a beautiful shade of green? 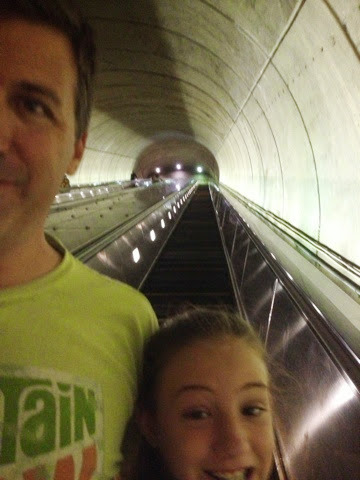 First we went up the longest escalator EVER! 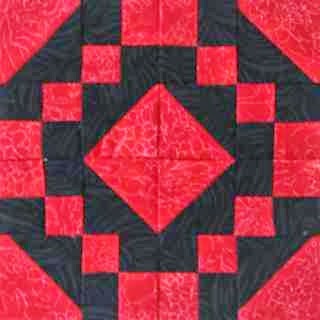 So no slow stitching today, but Friday, with 13 hours in the car, was a bonanza of hand quilting. I got most of the bottom border done on the small DJ along with a start up one side. The corner was a bit tricky to turn, and there are a few extra marks, but I think once those are washed away, it will look great. I had planned to mark the entire border before we left on our trip, but packing and laundry pulled me away, so I'll try to mark the rest before we head home again. I'm using a white clover pen and it seems to stick around pretty well. 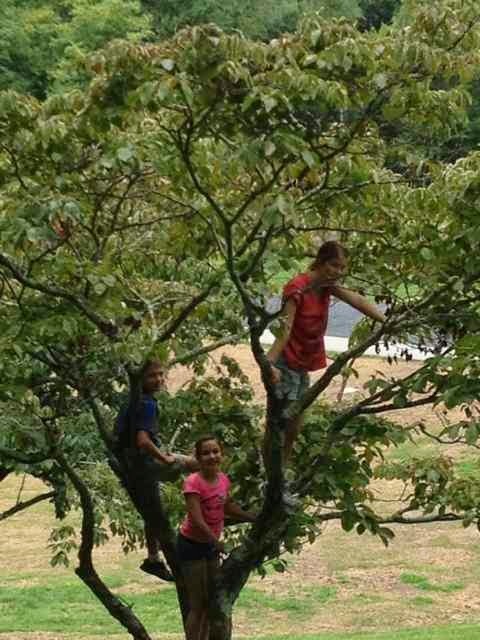 Fruit picking in the morning with a trip to Mt Vernon. It is the last Saturday of the month and sadly, time to say goodbye to red. Use misterlinky below to share all you red projects. August doesn't start until Thursday though, so feel free to keep working for a few more days to use up all the extra bits of red fabric you have on hand. I am glad that I am able to sew in the car. Also so happy to finally be working on the border! The end is in sight. 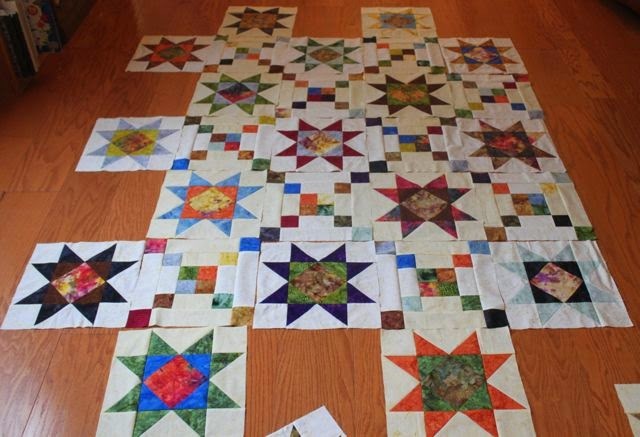 Ready for a little paper piecing? 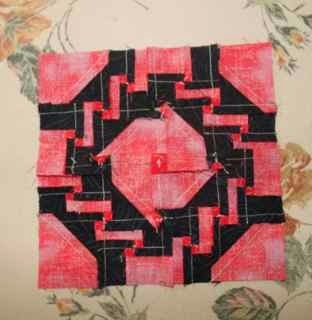 This block can be done with traditional piecing as well, but you would need a template or a special ruler. 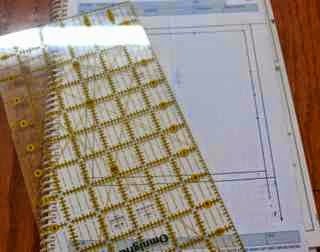 By drawing a paper piecing pattern on graph paper, you can make this simple block with no special tools. 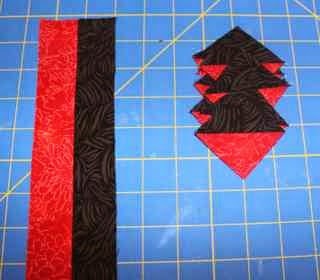 If you don't like paper piecing, you can also make a template using the same method of drafting the block. Don't feel like drafting your own block? There is a ready made version in the 6 inch size available here. The advantage to drafting your own though, is that you could make your block in any size. 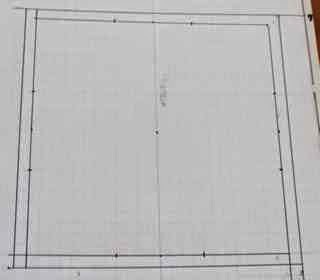 Start by drawing a box the size of your finished block on a piece of paper, regular paper will work fine, but I happened to have a handy sheet of graph paper. Next draw another line a quarter of an inch around the outside for your seam allowance. This step isn't mandatory, but I find it helpful. 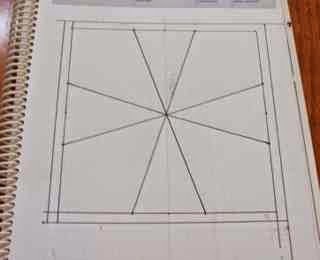 The next step is to take the finished size of your block and divide it by three. Since our block is going to finish at 6 inches, our number will be 2. You can see how easy it would be to make the same block larger or smaller by just remembering to find three equal divisions. There is no rule saying the numbers all have to be the same. You could make the middle section bigger or smaller for a different effect. Think of the possibilities! Now go all the way around the outside edge of the finished block line and put a little dash every two inches. You should have two marks along each side. Now the fun part. 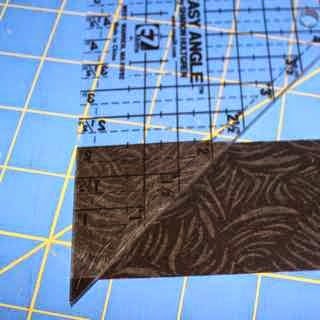 Start in the upper left corner and put the edge of your ruler on the dash, then line it up with the dash in the lower right hand corner. Draw a line from dash to dash. Now rotate around to the top right and bottom left to draw the next line. Continue to rotate around until you have 4 lines making two big Xs. Next draw a line forming a triangle in each corner. 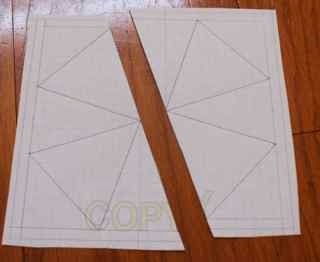 Roughly cut around the outside of your template to give you a rough size estimate while piecing. 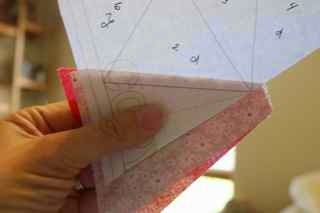 Next carefully cut along the first diagonal line you drew. To remind yourself of the piecing order, it is nice to number your templates. I started from the top and numbered the wedges 1, 2, 3 and 4 for the right half. For the left half I started from the bottom. This will help your seams twirl in the end. Corners come last, but feel free to number them 5 and 6 while you are at it. 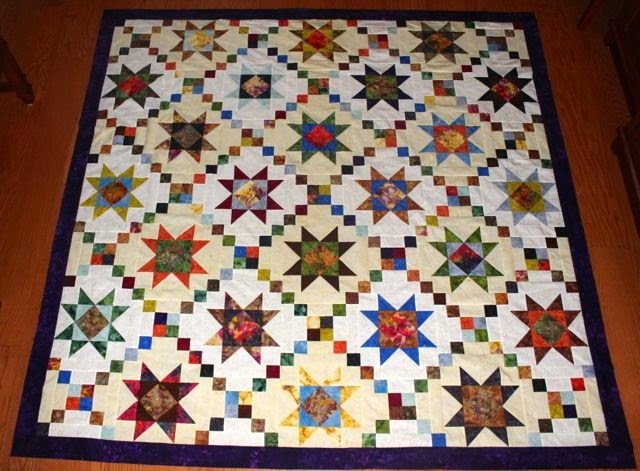 I'm not going to do a full paper piecing tutorial. 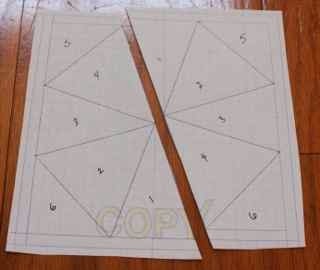 If you are new to paper piecing, try this handy tutorial. There are also some nice directions at the same sight I mentioned at the top of the post. I like to rough cut some triangles to start that are about half an inch bigger than the shape I am covering. This doesn't have to be exact, but it does make things easier. 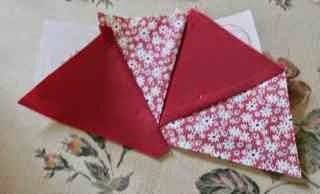 You can eyeball it, or make a quick pattern from the paper piecing template. All the center pieces came from strips of fabric about 4 inches wide. The strangest part of paper piecing is that the fabric goes on the wrong side of the pattern. Place piece one and two right sides together with one edge lined up. 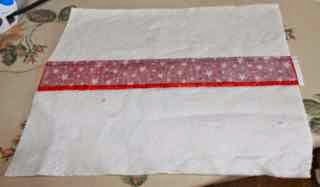 Hold your pattern up to a light to get about a quarter of an inch of fabric past the line between section 1 and 2. You can pin this in place to hold it temporarily, I am also fond of glue sticks, or just hold it with your fingers and hope for the best. Shorten up your seam allowance and sew on the line between section 1 and 2. Notice that the template is on top, right side up, and the first two pieces are right sides together on the bottom. Fold the second piece open and press. To add the third piece, first trim the seam allowance between section 2 and 3 to a quarter of an inch. Next add piece three, right side down on top of piece 2 and continue until all the pieces are added. The video tutorial is handy if you can't quite visualize this process. Though it seems backwards and awkward at first, it really gets easier with practice. The four corners can be added last. 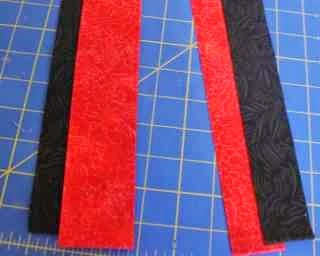 When all 6 pieces are sewn down, you will trim along the diagonal line, leaving a quarter in seam allowance. You can also trim around the outside edges now, or save it for the end. Here is your finished block. Viola! 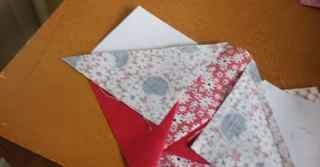 Last Saturday I made some string fabric out of red scraps. 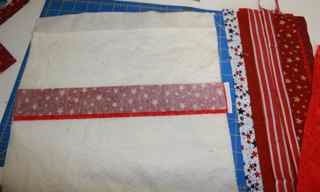 I made it quilt as you go on batting so that I could use it to make another boxy zipper bag. Here are some basic instructions which can be combined with this tutorial to make a cool zipper pouch. 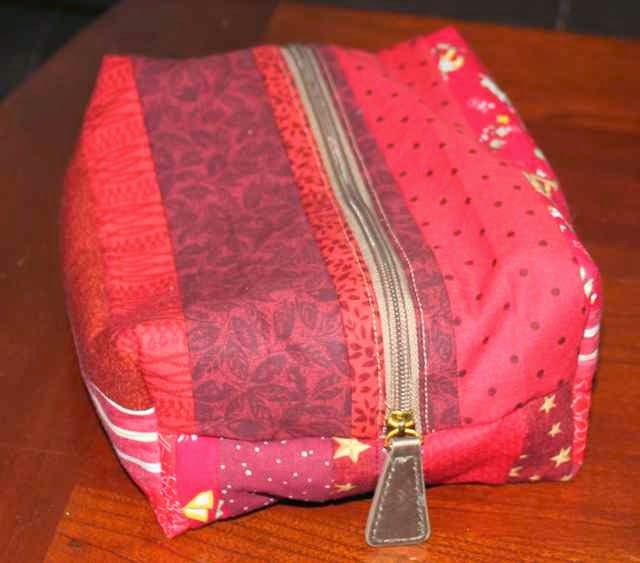 To make a boxy bag, you will need two pieces of outer fabric, each 10 by 12 inches. 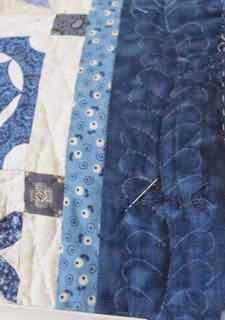 You could use interfacing to stabilize a piece of beautiful focus fabric, but you could also use scraps and an easy quilt as you go method to put some of your scraps to good use. Start with two pieces of 100% cotton batting 11 by 13, this will give you a little room to straighten every thing out at the end. The 100% cotton part is important, polyester might melt with the iron. I'm sure you can find something in your batting scrap bag that will work. I know I did. Also cut a nice pile of random strings, each about 13 inches long. Use whatever widths you have on hand. Mine were between 1 and 2 inches wide, but anything will work. Place two strings, right sides together, on top of the batting. Then sewn it down, right through the batting. This will attach the strings together and quilt them at the same time. Press the strip open, and then add another to each side. Continue to add strips until the batting is covered completely. 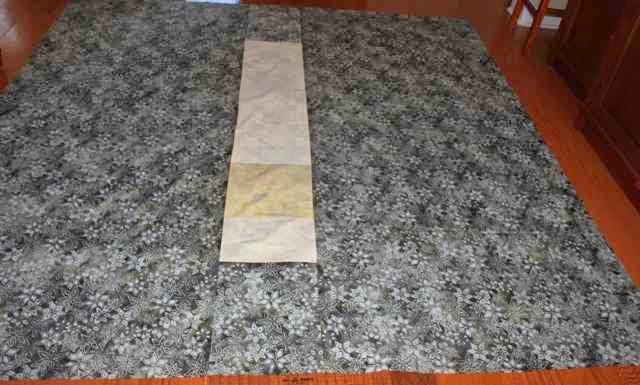 Trim the entire piece to 10 by 12 inches. 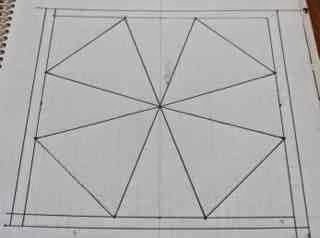 After you have prepared two pieces of quilted fabric, you are ready to follow the directions shown here. The pattern is a free download at craftsy and gives you all the details about how to make this adorable bag. It is boxy and cute and just the right size for all your bathroom things on a long trip or a few sewing things to keep you busy in the car. 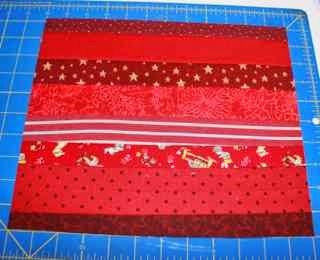 Start with strips of red and background in two inch and 1.25 inch sizes. The two inch strips should be at least 12 inches long and the 1.25 inch strips should be at least 24 inches long. 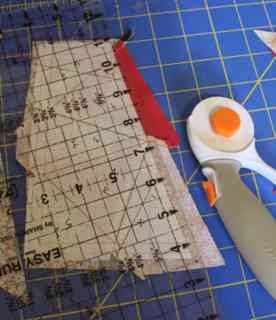 If you don't have scraps that long, feel free to use multiple short strips. This is a block that looks great scrappy. Place the two inch strips right sides together and use the easy angle ruler to cut 8 HST units. 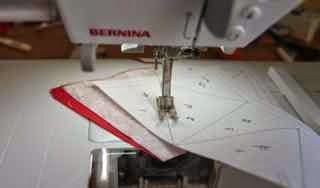 Now head to the sewing machine and sew the HST units together along the hypotenuse. 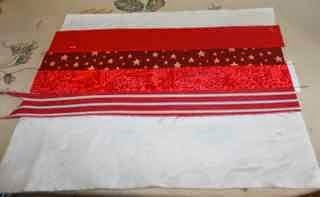 At the same time, sew the 1.25 inch strips together as well. Press the HST units and the strip set with the seams to the dark side. Sub cut the 1.25 inch strip set into 1.25 inch subunits. You will need 16 of these. 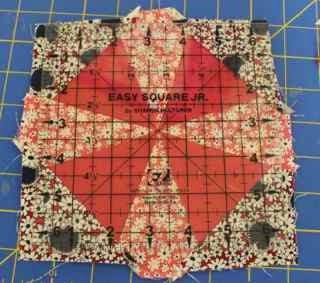 Pair them together to make 8 four patches and sew. Twirl the seams on your four patches and press them. Cute, right? Stack four of each unit together and arrange into a four patch as shown. Notice that the red squares make a nice straight line from the lower left to the upper right and the red triangles are all on the outside of the block. You are making 4 identical subunits that will be rotated to form the final block. 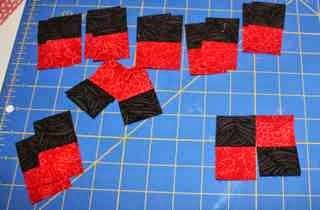 Sew all four four patches together. When pressing the four patches, be sure to twirl your seams . Everything lines up perfectly and all the seams nestle nicely, but only if your seams are all twirled. Here is your finished block. So striking in red and black. 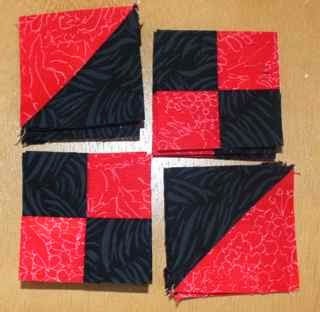 Yesterday afternoon I sewed the blocks together for Aunt Brenda's quilt. After dinner I put on the border. 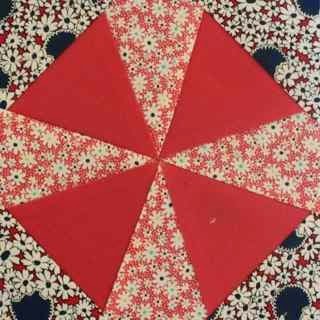 This morning I pieced a back out of this batik snowflake fabric along with a bit of extra backing fabric. I just need to make up some binding and a label so that I can send it off for hand quilting. 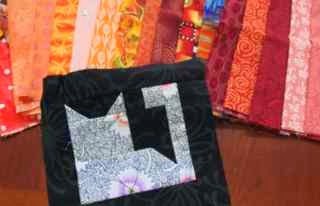 I'm thinking of scrappy batiks for the binding. Mainly because I don't have anything except what is left from this project. 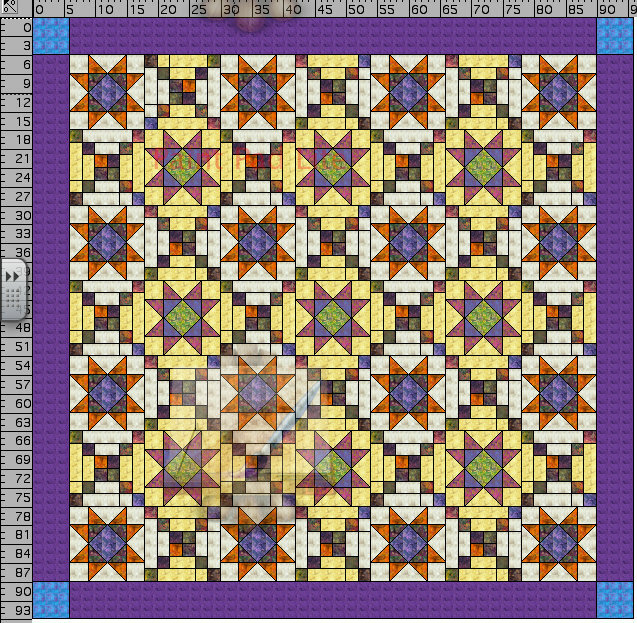 Looking at the 6 inch center part of the square, I am thinking this would make a stunning sampler quilt with 6 inch blocks in each of the stars. 24 blocks, 2 per month for a year. Maybe next year. 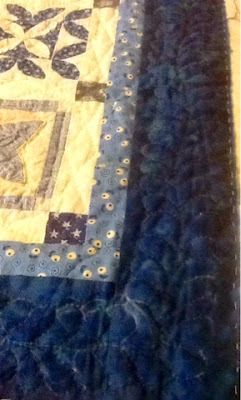 Just finished up the last block for Aunt Brenda's Batik Stars Quilt. The light is a little better today, so you can start to see the light and dark background effect. Still wishing for more contrast, but it is hard to find nice background fabrics in the batik family. Still enjoying the total effect of the quilt though. I'll try to get the rows pinned before the dog decides to rearrange everything for me. 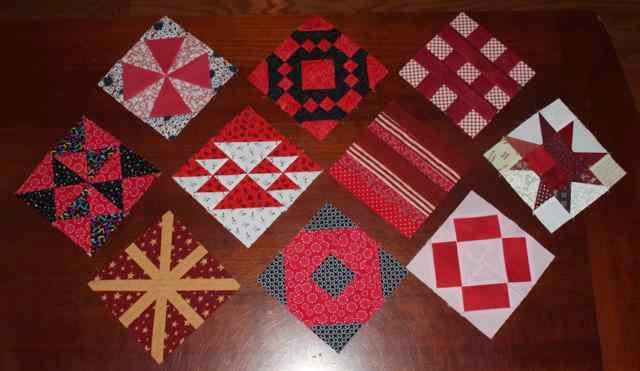 I've been putting together the blocks for Aunt Brenda's Batik Stars quilt. The two background fabrics ended up more similar than I had hoped, but in good light you can get the effect. 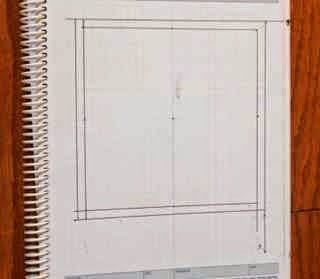 This was the original plan, I'm happy to have it to refer back to after putting it away last summer. 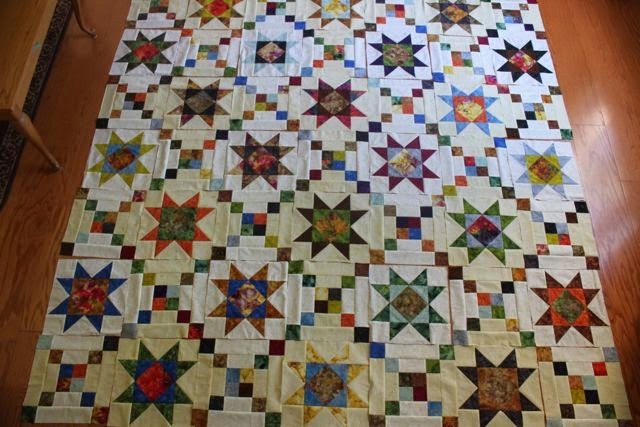 Aunt Brenda is getting anxious for her quilt though, so it has gone to the top of the list. Aunt Marilyn does beautiful hand quilting and she will be taking over that part as soon as the top is done. When my sister Heather came to visit before our vacation, she brought me some of Mom's things. Her husband Tom has sold the house and was ready to get rid of everything. Heather saved the photos and some sewing things to bring to me along with some Christmas decorations that are still at her house. 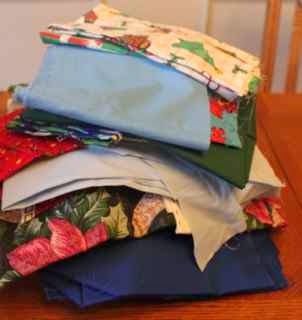 Mom liked to sew, but was never a quilter, and most of her fabrics were flannel or home decor. I did pull these cottons out out and will try to work them into a project or two. 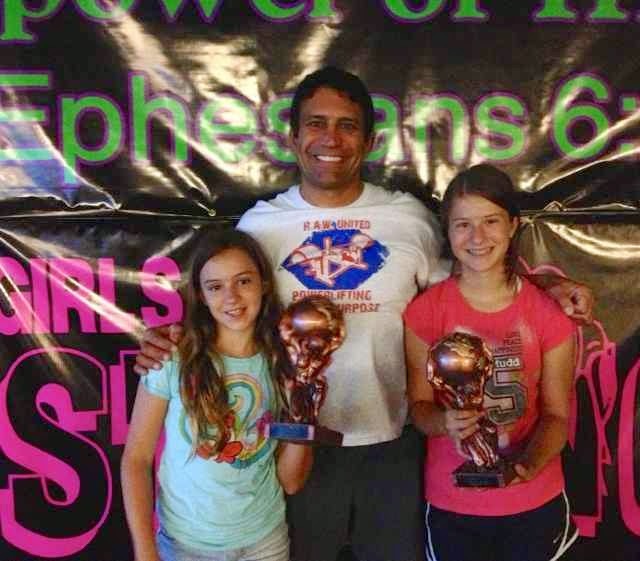 Here is a quick photo of the girls with their trophies from the power lifting tournament this weekend. They both had great lifts, Sydney went 9 for nine on her three events and Anna made all but one of her bench presses. The alarm at 5:30 this morning was painful, but I came home and took a quick nap before it was time to get up and take Anna shopping for back to school clothes. 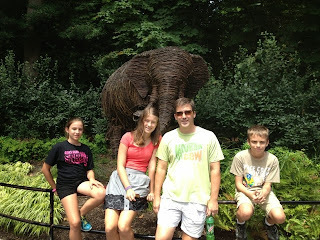 Then this afternoon we went zip lining at the zoo again. When we got home from that, it was time for Sydney to take a nap. Rainy days are so good for napping. Just before we ran out the door on vacation last week, a package showed up in the mail. I didn't remember ordering anything, but it felt soft and squishy. As I peeked in at oodles of orange fabrics, I remembered getting an e-mail from a blog reader, Sally, who said she had lots of oranges that she would love to send me, hoping it was going to be the color of the month very soon. Apparently people feel very strongly about orange! It was by far the most requested color in the giveaway linky party. I was planning to save orange for October and Halloween, but I guess you are all too impatient for that. So I'm not sure if it will come up in August or September, but I'll move orange up on the list due to popular demand. Best of all, the orange fabric came with an adorable cat block! So cute! I will definitely have to include this one in the Rainbow Scrap Sampler. Speaking of running out on vacation, I also meant to post the fabric giveaway winner before we left, but completely didn't. So thanks to the magic of the random number generator at random.org, Marsha Cooper is the winner of the lovely hand dyed fabric from Vicki Welsh. I'll get her fabric off in the mail and then get ready for the August giveaway. Marsha, you are a no-reply blogger, and I think I remember having a conversation that included your e-mail, but I can't find it now, so if you can please send me your snail mail via e-mail, I'll head off to the post office with your goodies. Sending away all this beautiful fabric is really making me want to play with some. I need an awesome project to feature a rainbow of hand dyes -- any suggestions? Sometimes when faced with a wonderfully coordinated bundle of fabric goodness, I get terrified and afraid to cut into it. Same thing happens when trying to make a gift for someone. I need to just take a deep breath and dive in. And on the topic of wonderful surprise packages, I stopped by school this morning after taking Ryan to the orthodontist. There was another surprise package waiting for me there. This one was not soft and squishy, but it was so much fun. 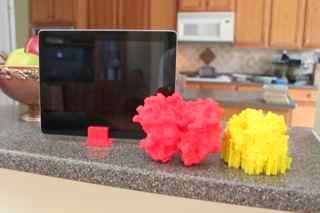 I was at a science technology training workshop earlier this summer and found out that our district has now has a 3-D printer for the use of the science teachers. One particular teacher volunteered to print things for us in exchange for keeping it at his school. So I promptly put in an order for oxygenated and deoxygenated hemoglobin. Check out that conformational change initiated by the bonding of the oxygen molecules. Cool, right?! And see the little red stand under the i-pad, it holds it perfectly vertical for video filming. I am SO excited! 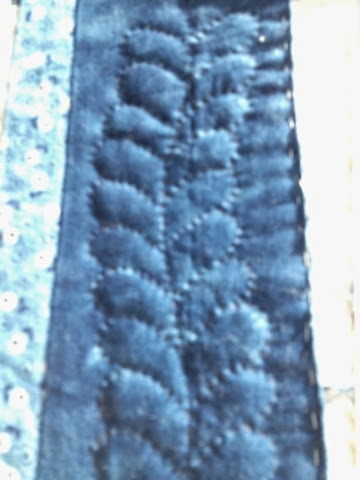 Speaking of excited, I finally started quilting the borders for the little blue Dear Jane. After much trial and error, I found that the clover white marking pen worked best along with a small collapsible square PVC quilting frame. Maybe I'll make a little zipper case for it before the next trip? Everything is better in a little zipper case.